Social media has acquired a reputation for being a highly polarised and argumentative public sphere. Whereas, the vast majority of academic social media is generally good natured, it can also be plagued by bad actors. In this post, Andy Tattersall shares a number of simple measures and tips on how to deal with the dark side of social media. When I reviewed Mark Carrigan’s book ‘Social Media for Academics’ in 2016, I used an analogy of the newborn giraffe and the duckling to describe how academics take to using social media. 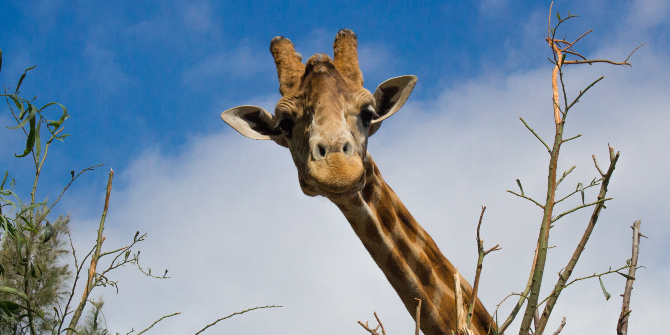 In my experience, academics adopt social media both readily, like proverbial ‘ducks to water’, but also like newborn giraffes, in that they are clumsy and open to prey. Taking this analogy a step further, the internet is also a bit like a nature documentary, most of the time we see these giraffes and ducks… living in harmony, but there are always predators, and when they strike, the results are permanently recorded and made available as entertainment for a global audience of millions. Look back over the last three years and the web appears to have become a more hostile, agitated and argumentative space. Fake news has thrown a spanner into the information literacy machine that the internet aspired to be, and opinion often seems to be ranked equal to fact. Yet, to roll over and accept that the biggest voice is the biggest expert, or that bullying on the web is acceptable, is ultimately a failure to engage with the world’s most significant communication technology and a loss to society. Academics have been using social media successfully in all forms since it first appeared post Web 2.0 in 2004. Many academics who have adopted social media have found tremendous benefits from the sharing, communication and networked understanding of research. Personally, I still believe the benefits greatly outweigh the negatives. However, academics who want to use social media have genuine anxieties and are worried about the online environment they are exposing themselves to. Sadly like society, there are some bad people out there, and if you go looking for them, you will have a bad time. To this end, whilst there is increasing pressure on tech giants, such as Facebook and Google, to make the web a safer environment for all, there is still a long way to go. For academics contemplating using social media, in particular Twitter, and also for those currently engaged with it, but who are finding it an unproductive space to communicate their research, I present a few prudent measures you can take to improve your online experience and protect yourself against some of its negative impacts. The first thing you can do when receiving unsolicited and unfounded negative content in your Twitter feed is to decide whether you want to engage with them at all. Look at their Tweets, do they move from argument to argument and do they show any signs of debate? Afterall, not everyone who disagrees with your work is a troll. If they are a troll and a timewaster you can simply mute the offender in your Twitter settings. If the level of comments towards you and your work are abusive you can block them, chances are they’ll move on. If you want to go further, you can report them to the social media platform. Before you do that, take screenshots of the posts and create a permanent archive of the page with the useful Save Page function on the Internet Archive’s Wayback Machine. If the abuse is threatening, and impacts negatively on your reputation and that of your employer then report it to your institution. They may take action, or even consider bringing in the police. This may sound excessive and it is important to note that this level of abuse is incredibly rare, but it is best to work on the adage that forewarned is forearmed. Whilst certain topics of research are targets for abuse, such as politics, feminism, theology, environmental research, there also groups of academics that are targeted. This should not be seen as the default level of communication when we are starting from a position of evidence. Academics should not be fearful of communicating their research because they will receive unevidenced opinion or abuse. In these cases it really is down to the individual as to whether they reply, but the main thing to remember is not to lower yourself down to the other person’s level. In the end, no one looks good after an acrimonious online argument. Your views might be your own, but are they really? Many academics employ the line ‘views are my own’ and ‘do not reflect that of my employer’ on their Twitter profiles. Your views may be your own and they may not reflect those of your employer and whilst your employer does not own your Twitter profile, they may see something that they perceive as harmful to their reputation. There is a fine line between ‘academic freedom’ and using your social media platform to say things that may get you into trouble. You may not care what your manager or department thinks of your Tweets, but if that profile has an affiliation with your institution (web address, email) it can be construed as speaking on behalf of them. As a result you might find yourself being invited in for a chat or even worse looking for another position, as has been the case for some academics when they’ve made some very ill-judged comments. Academic institutions are increasingly concerned about their reputation online and in some cases the threats to that reputation are not always coming from external sources. One of the simplest things you can do to have a better and more productive experience of discussing your research online is for you not to be one of the bad guys. It’s fine to have fun on social media in a professional setting but it is easy to overstep the mark and before you know it you’re Tweeting potentially snide comments about colleague’s, members of the public and students. The more attention you get the easier it is to throw the etiquette guidebook out of the window. Doing this is ultimately self-defeating and undermines core academic values of free and open debate. Stick to the facts, use evidence, be polite and most of all, don’t be an idiot – you’re better than that. The truth is that the web is the perfect environment for bad people to carry out their business the important thing is that you don’t become one of them. Andy Tattersall is an Information Specialist at The School of Health and Related Research (ScHARR) and writes, teaches and gives talks about digital academia, technology, scholarly communications, open research, web and information science, apps, altmetrics, and social media. In particular, their applications for research, teaching, learning, knowledge management and collaboration. Andy received a Senate Award from The University of Sheffield for his pioneering work on MOOCs in 2013 and is a Senior Fellow of the Higher Education Academy. He is also Chair for the Chartered Institute of Library and Information Professionals – Multi Media and Information Technology Committee. Andy was listed as one of Jisc’s Top Ten Social Media Superstars for 2017 in Higher Education. He has edited a book on altmetrics for Facet Publishing which is aimed at researchers and librarians. He tweets @Andy_Tattersall and his ORCID ID is 0000-0002-2842-9576.